Strolling into the British Museum’s latest exhibition, Ice Age: Arrival of the modern mind, you could be forgiven for asking why this long-established institution has resorted to displaying modern art, rather than the ancient pieces that it is famed for around the world. That’s because, from a distance, you could wonder what these stylish sculptures and paintings (attractive as they are) are doing in a building renowned for holding gems from classical times. But look more closely and you’ll see the majority of these exhibits are old, very old in fact – dating back as far as 40,000 years when the first humans spread into Europe from Africa. And not only are they wonderful works of art in their own right, but they also tell the story of us as humans and hark back to the time when what could be termed the brain, as we know it, evolved. This ‘modern mind’ was able to process, store, transform and communicate ideas as visual images. In contrast to many other exhibits in the British Museum the pieces here are small. I enjoyed seeing all the minuscule figurines, carved into ivory – with remarkable levels of detail. Lion Man (pictured on this page) is a great example, the sculptured and engraved features here are so clear. Of course, there is variation between the exhibits which is understandable given the large period covered (there’s more than 20,000 years of history here). 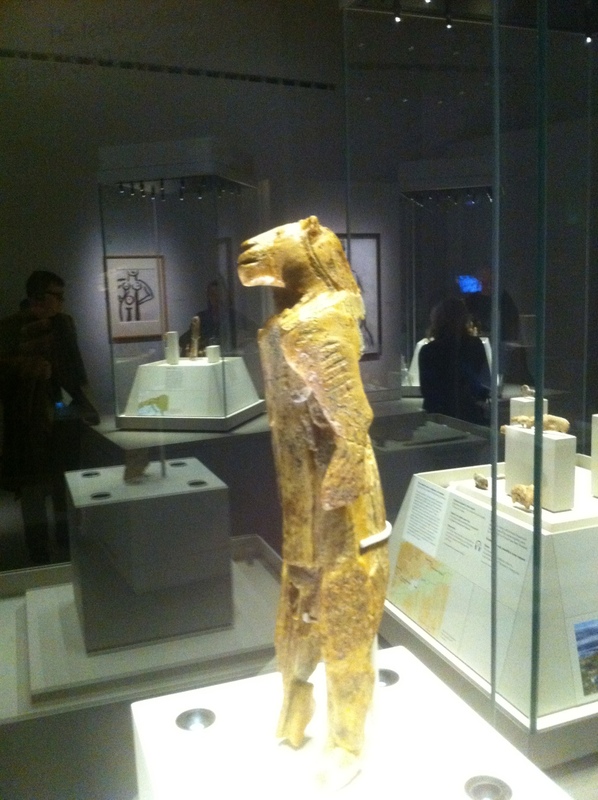 And visitors get to see pieces as diverse as sculpture, beads made of ivory and cave paintings. Visiting the exhibition, I found it amazing that people back then were producing such complex works of art. My understanding of that period was that of hunter gathers fighting for survival in hostile conditions, scavenging for food. The only items I can recall seeing at exhibitions from that period are tools unearthed from archaeological digs (there are some of those here, with art used to stamp on the identity and status of the owner). Explore this exhibition at the British Museum and you see humans living highly thoughtful and creative lives. Visiting Ice Age: Arrival of the modern mind is like entering an art gallery, but you learn a lot of history along the way.